We’d love your help. Let us know what’s wrong with this preview of Black Wood by Jayde Scott. Witches, trolls, nymphs and Silverfurs are surely the figment of one’s imagination. That’s what Emily Jones used to think until she moves to Scotland shortly before her fourteenth birthday to live in her deceased grandmother’s manor. Ravencourt Manor's just as creepy as she remembers it with plenty of creaking noises, rattling doors and a hunched shadow that roams the mano Witches, trolls, nymphs and Silverfurs are surely the figment of one’s imagination. That’s what Emily Jones used to think until she moves to Scotland shortly before her fourteenth birthday to live in her deceased grandmother’s manor. Ravencourt Manor's just as creepy as she remembers it with plenty of creaking noises, rattling doors and a hunched shadow that roams the manor’s garden at night. In the hope to bring her separated parents back together, Emily opens a portal to Black Wood; a world of dangerous and alluring nymphs dwelling beneath the streams ready to drown her, where the sinister guardian and keeper of the Black Heart and cursed trolls are waiting, desperate to be released. And so Emily’s long and dangerous fight against the evil Muriel begins. Will Emily learn to use her grandmother's legacy in time before the evil Muriel regains her full powers to summon and unleash her deadly servants on the world? To ask other readers questions about Black Wood, please sign up. This goes on my favourite list next to many such as Harry Potter and Twilight! I definitely recommend this to anyone who likes mythical stories that keeps you guessing! This might be written for young teens, but I had to read this after I read the story is about witches and Scotland, both which fascinate me. All in all, it was a fast easy read and deserves more than 5 stars but alas that’s the max so I give it a 5 stars and my 2 thumps up! This is what I get for trying out new books: a hidden real gem.I was glued to my seat the whole time. Where do i start? First of all, this is a great new teen fantasy book with a promising start to a trilogy. When 13 year old Emily Jones moves with her father to Scotland after her parent's devastating break up, she is being given a mystical diary where every word written makes her wishes come true. By using this diary, Emily opens a portal to a dark and dangerous world and meets a powerful witch, This is what I get for trying out new books: a hidden real gem.I was glued to my seat the whole time. Where do i start? First of all, this is a great new teen fantasy book with a promising start to a trilogy. When 13 year old Emily Jones moves with her father to Scotland after her parent's devastating break up, she is being given a mystical diary where every word written makes her wishes come true. By using this diary, Emily opens a portal to a dark and dangerous world and meets a powerful witch, whom she wants to be friend with. However, this witch has some secrets of her own and dealing with magic has consequences. Without her knowing, Emily is being dragged into a dangerous world she never knew existed. A world, where evil resides, and a dark kingdom wants to destroy everything good - including Emily, who has no choice but to fight against the evil with their own strategies: Magic. By embracing her own powers and becoming a witch, Emily has many spells to learn and many enemies who would do anything to keep the portal open so that dangerous creatures can step into the world of humans causing havoc. Without giving any spoilers, I can only say: I loved this book from beginning to end and recommend it to other teens. Can't wait for the next book to come out! When Emily receives a magickal diary that makes her wishes come true, she knew that magick can change her life. What she didn't know was that change can be for better or worse and that the serious, real-life danger would start the moment when magick opens a portal to a magical world. Now danger follows her everywhere and Emily no longer knows if she can trust anyone. 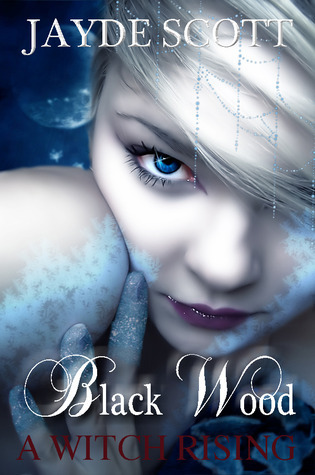 In Black Wood, she must learn spells, embrace her powers and enter the other world where evil rules the world. This was a great st When Emily receives a magickal diary that makes her wishes come true, she knew that magick can change her life. What she didn't know was that change can be for better or worse and that the serious, real-life danger would start the moment when magick opens a portal to a magical world. My daughter reports she loved it and is eagerly awaiting the second book in the series. I also enjoyed it a lot and found the writing beautiful with plenty of vivid description. The story of Emily who finds out she's a witch and now has to enter Black Wood was fast-paced and entertaining. I laughed and held my breath as Emily moved from one adventure to the other, meeting fantasy figures as she battled evil. A captivating story that will appeal to teens and young adults. For 99 cents how could I resist to buy it. To my pleasant surprise in return, I found a wonderful talented writer and a great story. I sure enough wanted to have this diary - which makes wishes come true if you write them down- that is, till I read what happened. All in all, a very good read and I would recommend this as summer read. After I read a job from hell, knew I had to buy a witch rising to read on my kindle and was not disappointed!! It's very thoughtfully constructed.Started slow then pulled me in. Once it got going I kept on reading and reading until i reached the last page which left me there thinking and wanting to read more wondering just what will happen next in the black wood series. Fairly good, though nothing to really rave at. A YA book to be certain. I was intrigued from the beginning, this story was very well written and I thoroughly enjoyed it. The story was about a young girl named Emily that has moved to Scotland with her father after a split with her mother due to irreconcilable differences. Ravencourt Manor is a source of both good memories of her grandmother and a some pretty spooky happenings. At 14 years of age she not only has to deal with her parents break up, she soon finds out that she's the only hope Ravencourt has to keep an evil witch from taking over. With a cliffhanger ending this book promises to be the beginning of a fantastic series! Jayde Scott has a knack for writing young adult paranormal suspense that is riveting and interesting. I can't wait for the next one! As with many free or very cheap ebooks, this is a DNF for me. I have read worse, but really, life is too short. I made it through 5 chapters of vague characterization, random plot, and not enough background to keep me interested. There's too much telling and not enough letting the story unfold, with huge fill-in-the-gaps story line, accelerating the plot before it's ready. Frankly, I have better things to read. I don't think this book should be classified as Young Adult, the tone is too immature and just not serious, and it disappointed me at first. Once I tried to see it as a Children's book, though, it turned out pretty good. The protagonist is, after all, only 13. The story still suffers from a slow-moving plot and a rather passive protagonist, but that gets better by the last third of the book. I wrote this story a few years back when I was into witches, magic and Latin. quick read. loved it..even if it is for younger readers...a good in between books type of book. worth the money. I read this book yesterday and I loved every minute of it. Hard to put down, leaves you wanting for more. I'll start by saying that I really liked the characters in this short novel. Emily might not be one of the most interesting ones, but her older brother Sam was hilarious and breathed life into the story. I liked Aurelie and her nephew, Clifford, as they were eccentric and creepy to Emily until more was discovered about who they were. I think this story functions really well as Middle Grade reading material and not as strictly Young Adult teen fiction. Parents could allow their young children to r I'll start by saying that I really liked the characters in this short novel. Emily might not be one of the most interesting ones, but her older brother Sam was hilarious and breathed life into the story. I liked Aurelie and her nephew, Clifford, as they were eccentric and creepy to Emily until more was discovered about who they were. I think this story functions really well as Middle Grade reading material and not as strictly Young Adult teen fiction. Parents could allow their young children to read this without fear of profanity, sexual situations, or violence. The protagonist is a thirteen-going-on-fourteen year old girl, and I think it's perfectly appropriate for a much younger audience, provided the younger child can read at the level of a thirteen-year-old. I did, however, wish the scene where Emily trains as a witch, learning chants and spells, had been shown rather than quickly summed up in a few sentences. I would liked to have seen a bit of the process of her learning how to be a witch. And, it is a very quick read with a thin plot that comes to a quick resolution, although it ends right when another complication begins to develop. It feels like a cliffhanger, but the main plot does have a resolution and this new development serves to set up the beginning of the next volume that furthers Emily's overarching story goal. I'm hoping the next installment is a bit more original, but, still, I liked the surprise twist at the end where Emily quickly glimpses someone unexpected of particular interest right before she leaves the world of Black Wood and returns home. I liked this story and would recommend it to people of all ages who like the Harry Potter series, as well as other children's adventure/fantasy fiction. Its fine. Not so great for me. But because I already started it might as well continue to read the next one. Am just wondering how come the main character never thought of asking her new friend why he wanted her to open the portal? Thay's how the story begun in the first place for me. Oh well. The story is fine if you won't think of how it all transpired in the first place. Cute, imaginative spin on the genre. Very junvenile spin on everything. From cover art and brief descriptions couldn't descern target audience was tweens. Read anyway. Will not buy sequel in series, don't care about charecters. Curiously, at time of purchase for $0.99 bought two more by author. One about divorce and one set in Brazil about vodoo. Hopefully, they will be a little juiceier. 2.5 stars. I like the idea and the story has potential but seemed like it needed a little more work to me. I stumbled through and then halted at the end. And it seems more middle grade than YA. So, if you like girl trying to help family dealing with trolls and evil queens, this might be okay but don't expect the best in story telling. It's a good try at least. Cute story about a young girl who discovers that she is a witch that has to save the world. It was a little short for me, but it was still good. It will be interesting to see where the second book takes you. For the most part I liked Emily. It would have been nice to have some more backstory on Black Wood and Emily's grandma. Aurelie teetered between creepy neighbor lady and helpful teacher, but I never really got a good feel for her. If the second book is on sale I might get it. Honestly, loved it. It is another teen series, along the lines of the Harry Potter series. It was page-turning good. I read the first book in an afternoon. Easy to care about the characters and get invested in what happens next, which makes it a fun read. This story was just ok for me. I felt like the author rushed through the story and could've gone into more detail. Fun fantasy. Emily didn't know the truth about her grandmother until she had to move away from her London home to live in her grandma's creepy, old house. It wasn't bad just very juvenile. Read like a children's book. Simple characters and you knew what would happen a mile away. I think this should be a children's book or a book for reluctant readers. It wasn't really what I was expecting, but it was a quick read and fairly good. Great, imaginative book for teens. The language is age appropriate. Very good cliffhanger ending.